Like many Conway alums, my education and past work experience shows my range of interests, choices, and opportunities. I studied religion during my undergrad years and spent a few years living and working in an intentional community in central Virginia. When I applied to Conway I was at the tail end of an 8-year career serving adults with developmental disabilities. Communal living and resource-sharing led me to a deeper understanding of and passion for sustainable agriculture. Living on a farm reignited my desire to live in a city. I dug deeper into permaculture, stormwater management, and regenerative design. I wasn’t entirely sure what I was looking for, but I knew it had something to do with growing food, improving our water quality, and making our communities more resilient. When I learned about Conway, I immediately realized that I had found what I was looking for. There was just no question for me — this was it. How did you first learn about Conway? Dave Jacke (Class of ’84) led a two-day permaculture track at a sustainable agriculture conference that I attended in 2012. At the end of the first day he and the other presenters spread some of their designs out on the tables for attendees to peruse. I remember feeling so excited flipping through the basemaps and trace paper layers of analysis. I was so captivated by this process of design; I knew in that moment that this was the career change I wanted to make. Dave pointed me to the Conway School. Conway is like nowhere else. You’re in the field, in the forest, in the classroom, in the city, in the country, at the riverbank, and on the mountain top. You draw by hand and by computer mouse. Classroom conversations weave together environmental justice, climate change, food security, responsible forest management, habitat restoration, urban design and the need for more ecological design in our world. You learn to emphasize the context and the process. You learn how to communicate complex ideas through clear graphics and concise language. You collaborate with your classmates to find solutions. It depends on the task. A good pen, a wireless mouse, a solar-tracking app, a soil knife, garden scissors, and a good pair of shoes – all of these things have made my days a little brighter. Talk to your peers and colleagues. You won’t be new forever. You probably know more than you give yourself credit for. 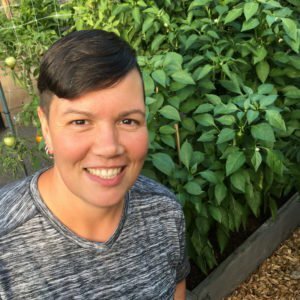 I help connect people to the process of growing food and to the beauty of native perennial plants. As the Landscape Designer at Green City Growers I meet with clients, assess their property, make recommendations, create a design, and send them an estimate. I love this work because I am designing and installing productive landscapes that make the world a better place (cliche, but true). These landscapes provide food, ecological services, and countless environmental & health benefits.